My name is Iselin Wang, and live on the West coast of Norway, in Os right outside of Bergen. Kennel Nizhoni my registered breeding prefix, approved of the FCI and the Norwegian KC in May 2007. 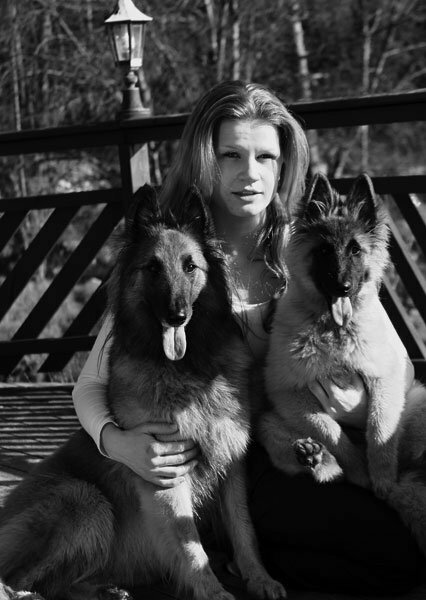 My passion is Belgian Shepherds, and in particulary the Tervueren. I will in my breeding program, strive to produce the best possible dogs. A versatile dog that's beautiful, social and able to excel in any kind of dogsport. The first litter of kennel Nizhoni was born in April 2009, and so far, the litter looks good. this was my first "big love" Azar-A'Treve "Trevi. A great dog, but yet a very special one..
so that maybe my dream of having a breeding of my own, could come true. So in June 2006 the little rascal that's sharing my bed, couch, food, car etc.etc.etc. came in to my life. for showing me the trust of having this amazing girl. Thank you for helping me through all the ups and downs. and another wonderful producer Canela de el Segadal. so that each indivdual dog get to be exactly that; an individual..
And my dogs live as pets sharing my home and family. the real treat is to actually be so lucky as to share my life with them.